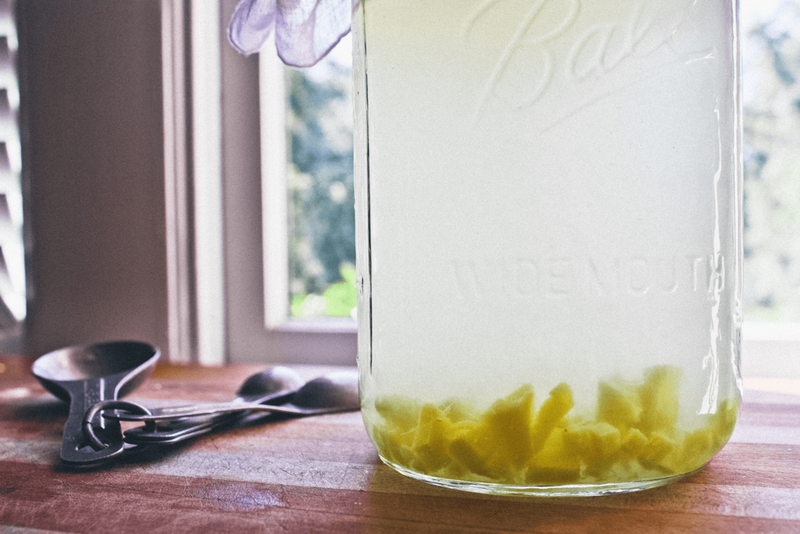 A ginger bug is conceived through the presh process of lacto-fermentation, much like our recently made water kefir. Often used as a naturally fizzily soda starter, this fermented friend is more than just a jar of fun - our bug packs the obvious perks of good gut bacteria plus the medicinal properties of its namesake, ginger. Quick refresher: lacto-fermentation is the anaerobic process by which beneficial yeasts and bacterias go wild style to break down sugar, which in turn forms lactic acid (a natural preservative that prevents growth of harmful bacteria). Lack of oxygen during this fermentation process prevents carbon dioxide from escaping, thus providing you the bubbly effervescence so many of us cannot live without (Lacroix fiend hi). The ginger bug came to be, as a common kitchen tradition for homemade soda starters in alternative to its less accessible counterpart, the ginger beer plant. The plant, not actually a plant but rather tiny grains similar in texture to our water kefir, is a rare symbiotic culture, historically connected to the rise in popularity of ginger beer and other carbonated beverages over centuries ago, until ultimately being replaced by brewer’s yeast. Occasionally people assume ‘ginger bug’ as simply another name for ginger beer. But not so. The ginger bug is in fact a wild fermentation, meaning it feeds advantageously off the natural occurring yeasts and bacterias, which allow beneficial microorganisms to thrive. Ginger root, naturally rich in lactic acid bacterias and wild yeasts, allows for ginger bugs to bubble so quickly (often within 3 days). But because these posi microorganisms feed and proliferate off of the sugar so efficiently, ginger bug bubbly is rarely ever sweet and therefore full circle does not taste like the common ginger beer. For the makings of our ginger bug, this wild fermentation functions on the mixture of three simple ingredients: unrefined sugar, fresh organic ginger root, and water. In perf harmony they work to round up our aforementioned wild yeasts and helpful microorganisms; bestowing probiotic properties which promote healthy flora production and preservation of nutrients. But amongst all this fermentation magic, let us not forget the ever-healing abilities of the actual ginger itself. Historically, and quickly gaining traction with modern medicine, ginger has shown to effectively treat stomach discomfort from nausea, indigestion, vomiting, and cramps. Studies have also shown ginger as superior to common OTC drugs for treating severe morning sickness and motion sickness when taken in small doses. Gastronomically, ginger can also encourage absorption and stimulation of essential nutrients and enzymes while promoting better digestion. Ginger root may help boost the immune system too, as it contains chromium, magnesium, and zinc, which improves blood flow for regular circulation. Germ fighting agents help to aid in the breakdown of unwanted mucus, fight bacterial infections, and inhibit fatty deposits from reaching the arteries. Yet at the root of ginger's (har) medic magic, is its powerful anti-inflammatory properties due to the potency of its main active compound, gingerol. Gingerols, chemically related to the compound capsaicin which gives peppers their spice, is usually found to be a pungent yellow and responsible for ginger’s distinct flavor. This component has shown to be extremely effective with reducing pain and improving mobility by reducing joint swelling, imperative for those who suffer from osteoarthritis and rheumatoid arthritis. Gingerols have also proven to help inhibit the growth of cancer cells, particularly those of ovarian cancer which develop under a pro-inflammatory state. When treating inflammation on a more casual level, ginger can be an incredible substitute for medicines like ibuprofen and aspirin without the potential liver damaging side effects. Because ginger root is highly concentrated, a little bit can go a long way. Often (with most raw foods) exposing ginger root to high heat can deteriorate its beneficial properties. But because fermentation is an incredible form of preservation, ginger's many nutrients are perfectly kept and presented in a more digestible form. So rejoice with ye fellow hippie moms, for here we give you a reliable ailment remedy workin' double time to plz dat gut. You can sip it straight strained from the jar for a quick pick-me-up, but just be sure to re-fead the pet with more sugar so that bacteria can continue to grow. You can also easily use it as base for all sorts of fizzy drinks - mix in about a 1/4 cup of yr bug with fresh fruits or fruit juices, herbs, tea, on and forever of endless combos. Impress those diet-coke convicts you call friends. Jah knows you'll impress me. ** +1 for hippie moms -- ginger that has been imported is often times irradiated, effectively killing all those lil wild style natural yeasts and bacteria we need to cultivate!! Purchasing organic produce assures it has not irradiated. 1. Grate or cube ginger - you can choose to leave its skin intact. 2. Add to container and mix in sugar. 3. Fill up with water and watch 'er work! The process typically takes around 3 to 5 days. You can choose to loosely cover yr bug with a cloth for its during initial fermentation, but remember that if you want the bubbly you'll need to use an airtight container. If using a glass container or jar, be careful to not let it go unopened for too long (say longer than a few days) as the CO2 pressure could force the glass to explode. Continue to properly burp yr bug while storing it.